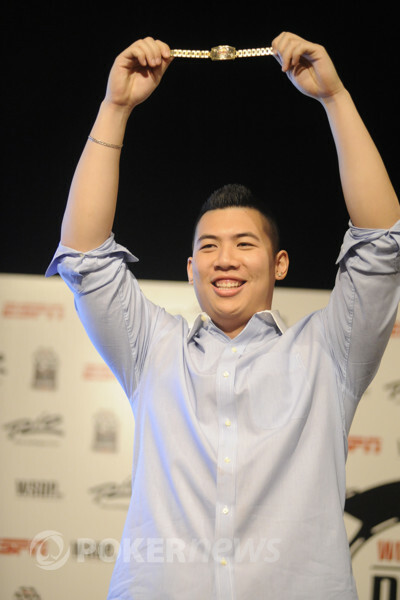 After another huge day of poker action, Henry Lu has been crowned the champion of Event 43: $1,500 No-Limit Hold’em. A great effort from Lu saw him pocket a cool $654,380, along with taking home his first World Series of Poker gold bracelet. That's not to mention the fact that earlier in the day he was down to less than two big blinds, but we will get to that. The day started with 20 players all hoping to make it where Lu stands right now. Of course, there can only be one winner and so 19 players fell by the wayside throughout the day. The first of those players was Michael De Gilio, followed by Andres Sanchez (20th), Adam Foster (19th), Carl DiVeglia III (18th), Daniel Zeihen (17th) and Michael Morgousky (16th). At this point the eliminations started flying fast as Mark Ketteringham (14th) and Michael Judge (13th) joined the above players on the rail. Randy Lew started the day with one of the larger stacks, but was never able to get anything going on Day 3. 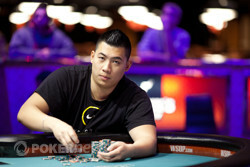 The eventual last hand of Lew’s tournament saw him all-in holding against the of Henry Lu. A board gave Lu enough to eliminate Lew in 12th place and we were one player away from the “unofficial” final table. The story of the day was definitely the fact that Lu had seen his chip stack increase from just 40,000 earlier in the day, all the way to 1,400,000 by the time he had eliminated Lew. That amount was only good for a little more than one big blind. Lu then continued to see his stack increase as he amazingly eliminated Jess Yaginuma in 11th place to see us head to the “unofficial” final table. With ten players still in contention, it was Zach Clark who couldn’t survive to see an official final table appearance added to his poker resume this summer. Clark’s final hand was an unlucky one and something which saw Lu continue his run good. Clark’s was outflopped by Lu’s , with Lu’s set enough to send Clark to the rail. With that, Lu had eliminated the last three players before the final table and would go into the final nine with 10,000 chips less than Neil Channing, who was the chip leader. 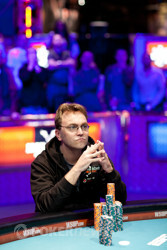 The first player to be eliminated at the final table was Jared Rosenbaum. It was Channing who dealt the fatal blow to Rosenbaum, with his too strong for Rosenbaum’s as he increased his chip lead even further. The eighth place spot would go to Francois Dur and it would again be the of Channing that would prevail. This time Channing was up against and with no help for Dur, he was out the door with $63,459. Balazs Botond was the next to go in seventh place, with his short-stack being shoved in the middle holding and not finding any help against John Nelson’s . Neil Channing was still the chip leader at this point and that would grow even stronger as he eliminated Hovan Nguyen in sixth place. Channing’s chip lead would increase even further as he dealt the fatal blow to John Nelson. Channing held on a flop and was up against the all-in Nelson, who hel . No help came on the turn or river, and Nelson was eliminated in fifth place. Coming back from a dinner break, Channing held more than half the total chips in play and that continued as he took down the biggest pot of the tournament. Channing then went on to continue his dominance, eliminating Tom Alner in fourth place when Alner open shoved and couldn’t compete with Channing’s . Going into three-handed play, Channing held three quarters of all the chips in play. James Mackey managed to win some of those chips by doubling up through Channing, but on the very next hand was eliminated in dramatic fashion. Mackey held and was up against Channing’s . By the time the board had run out, it was looking Mackey would double yet again. However, the powers that be had other ideas, slamming down a on the river. With that, Channing had eliminated five players in the lead up to the heads-up battle and would hold a 5-1 chip lead over Henry Lu. However, Lu would not go down without a fight. One of the earliest hands of heads-up saw Lu double up, then from there he took down a huge pot to see the chip lead swing his way. From there, it was a roller coaster ride of ups and downs, with Channing holding his huge chip lead on multiple occasions. Lu was all in and at risk twice, doubling both times. From there it was nothing less than epic battle that lasted almost three hours. Eventually the last hand of the night played out, and in classic tournament fashion, it was a flip for his life that Channing couldn’t survive. Channing look shattered after the loss, but must be commended for his gallant effort that sees him pocket $406,409. That amount sees Channing’s all-time tournament winnings now eclipse $3 million, and we are sure he will continue searching for that WSOP gold bracelet that has eluded him so far. Congratulations to Henry Lu for becoming the champion of Event 43 and taking down his first bracelet. He truly lived by the old poker adage that says a man only needs a "chip and a chair." That’s all from us tonight, be sure to return soon as PokerNews continues their live coverage of the 2012 World Series of Poker. Neil Channing opened to 250,000 from the button and Henry Lu moved all in. Channing called for his tournament life and the cards were tabled. The crowd rose to their feet and watched the flop come . The turn came and Channing picked up several more outs. But he would brick when the river fell . Lu's rail mobbed him on stage in celebration in stark contrast to Channing who sat motionless, completely stunned that the tournament was over. He finally got up from his chair, shook Lu's hand and walked out to a round of applause. Neil Channing opened for 250,000 on the button and Henry Lu called. The flop came and both players checked. The turn came , Lu bet 280,000 and Channing called. The river came , Lu bet 350,000 and Channing folded. Henry Lu opened to 25000 on the button and Neil Channing called. The flop came , Channing checked and Lu bet 300,000. Channing called and the came on the turn. Channing checked, Lu bet 450,000 and Channing folded. Henry Lu was on the button when he opened it up to 250,000. Neil Channing called and then both players checked the flop and the turn of a board. On the river, Lu checked and Channing bet 450,000. Lu folded his hand and Channing took down the pot. Neil Channing opened to 250,000 on the button and Henry Lu raised to 675,000. Channing took a good bit of time before he re-raised to 1.475 million. Lu moved all in and Channing let his hand go. Neil Channing limped the button and Henry Lu checked behind. Both players then checked the flop and checked the turn. On the river, Lu led out for 120,000 and Channing quickly mucked, sending the pot to Lu.